Labour leadership is one of the most tightly contested races in UK politics. Jeremy Corbyn, who was not anywhere close to the winning quartile, is now among the strongest contenders for the Labour leadership. The Odds on Labour Leadership tend to fluctuate severally therefore political betting calls for caution and tact so as to win big. The election could go any way. Senior Labour leaders have issued warnings to the members of the party not to vote Corbyn since this could mean an easy win for the Conservative party in the general election and send their party back to turmoil but he is surprisingly the leading contestant in odds and polls. The betting markets have risen to become powerful indicators of the direction of the polls since they incorporate wisdom and knowledge of people who trust their judgment with their money. Money is so close to the heart therefore this is a jokes aside type of venture. Labour leadership odds often contradict the polls and this has become a norm in various general elections leaving the pollsters quite embarrassed. Political betting depends on the debates and the political rallies made by various politicians and the popularities of the policies and ideas. Jeremy Corbyn is the leading candidate so far in the polls as well as the odds favorite despite negativity from various sections of the Labor party and this popularity seems to grow as shown in polls and the decreasing odds. 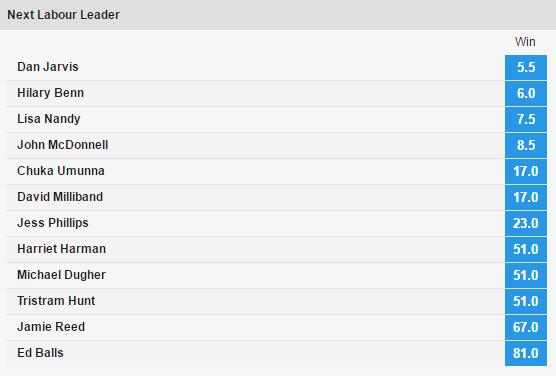 Andy Burnham who was the front runner for a long time is now at second, followed by Yvette Cooper and Liz Kendall. The political wave tends to fluctuate frequently just like the ocean tides. The comments and opinions of the politicians on critical matters can influence the whole election. The biggest winners would be those who placed their bets earlier on a contestant like Corbyn in his less popular days with odds of over 50. Well this is wishful thinking because odds indicate the likely outcomes so no player would go against the odds unless he or she is a total risk taker. Political betting is among the fastest growing betting types. It involves placing money on your judgment. Expert political analysts are always present to scrutinize the strides made by various politicians and aspirants vying for various seats hence the work of the gambler is quite simplified unlike in other betting games. The race for labour leadership has high odds since it is a highly contested seat that attracts many influential politicians. This is beneficial since the wins are quite big on very possible outcomes. In addition, the chances of getting upsets through surprise victories are seldom in this particular race and this increases your chances of winning significantly. Moreover, the high probability of winning encourages you to risk big and win even bigger. Political betting is quite fun and entertaining. It is very easy to win since all is required is to put your ears on the ground, identify the most popular leaders and place your money on their win. Fairness is quite irrelevant in the game. Well elections in the UK are free and fair and the credibility is externally governed, you do not have to worry about the online or live casino you place your bet in. There are more pressing issues to be concerned about such as the odds. The election period is basically a profit making opportunity for many. 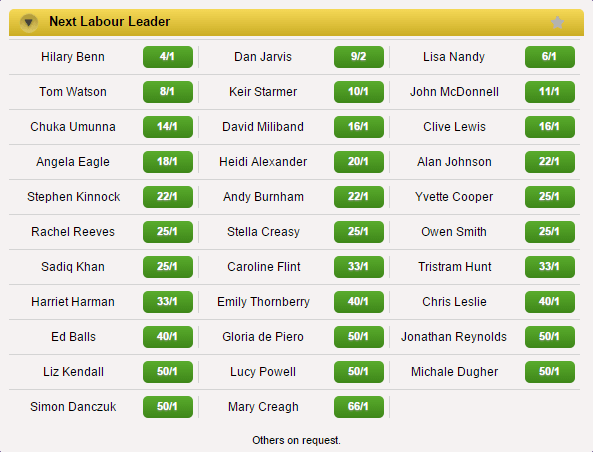 Labour leadership odds are lucrative and a great chance of making big money. However, it is not the only market available. The other markets offered are EU Referendum: UK Vs Scotland, Prime Minister, To Remain in EU Vote percent, EU Referendum: Regional Results, Date of Next Election, Most Seats and Overall Majority. The race for most seats is tightly contested in nearly all elections since it is the most effective way of running the country for the next term and the odds totally reflect this situation. They are usually quite high but the prediction is also tough. The other parties which include Conservative party, Labour party, Liberal Democrats, UKIP, SNP and the Green Party also have toughly contested leadership races. The leaders have a great impact on the popularity of the party and its chances of winning the next general election therefore no stone is left unturned and nothing left to chance in the election of the leaders. 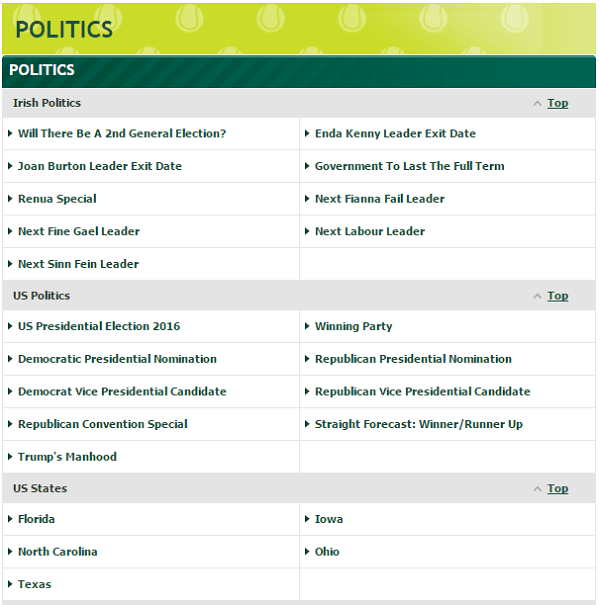 Which Bookies Have Higher Odds for Political Bets? 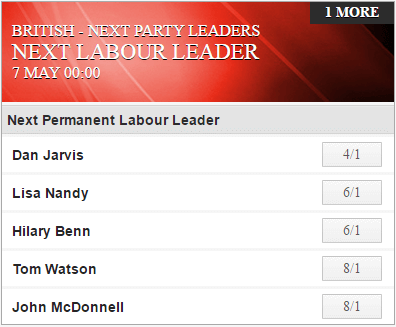 The odds on labour leadership are generally attractive in both land and online casinos. The casinos tend to be careful in the awarding of odds since any mishap could lead to loss of money. Moreover, labour leadership odds tend to be more reliable than the polls in the prediction of the winners. Online betting sites however tend to have considerably higher odds that the live casinos. This is because the expenses are generally lower than the expenses in live casinos therefore they can afford to award higher odds for possible wins so as to attract more customers. This is actually their main mode of advertisement as compared to live casinos that can have physical advertisements. The online casinos don’t have premises to take care of and other costs which allows them to offer higher odds. Political betting is so fun and entertaining and gamblers simply cannot resist it. 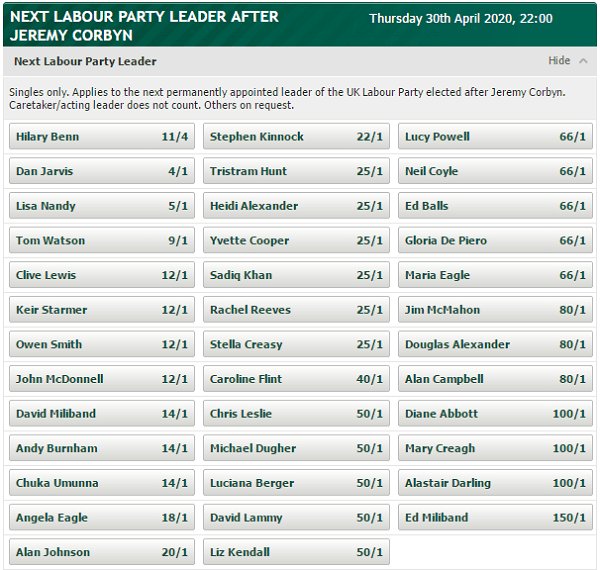 The odds on labour leadership are attractive and winning has never been easier. It is a great idea to put your money where your judgment is and it will surely earn your money.